Shop from place to place, and observe what you understand and how each business makes you feel. Then trust your insight. Make a list of firms that get your attention, and then call their shareholder relations division and ask for more details. By starting your list with companies you already have a first- hand experience, you increase the odds significantly that you will make shrewd selections. It doesn’t matter how well you do your research, how often you buy and sell, or how much you pay to professionals for their guidelines and information, if you fail to choose the stocks that represent value. You won’t succeed. Although some investors are good at anticipating the trend of the market and timing the ups and downs, if they don’t buy the worthy stocks, they will still meet with troubles when trying to gain profits. As a result some of the best paid people in the stock market Industry known predominantly for their aptitude at picking stocks. 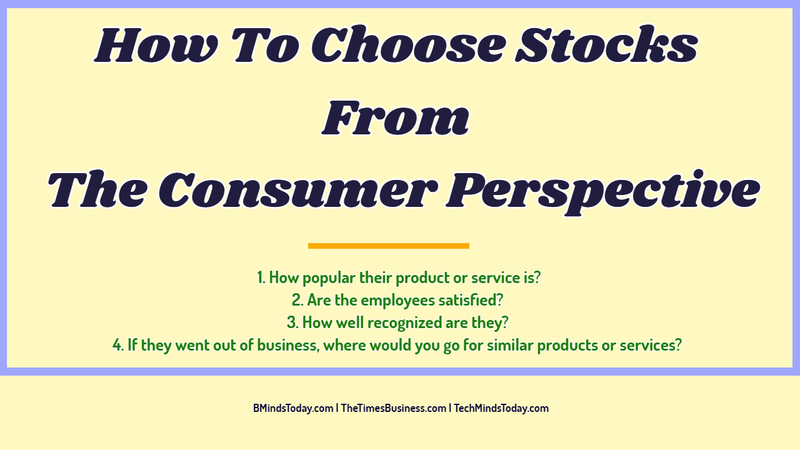 Financial consultants give talks and write books about how to choose stocks that will outperform the market, and most experts repeat the same sentiment and agree that one of the best methods to judge a stock is from the point of view of a consumer. By using instincts we have already improved as regular shoppers, we can often search out data that even the most experienced and software-savvy market observers miss. While they study analytical charts, and earnings reports, people just like you actually do business with the firms they invest in, because their experience as a customer speaks volumes about the value of the company and its products and services. 1. How popular their product or service is? If every person you know uses it, and is gratified with such things as price, customer service, and trustworthiness, the company is most likely well positioned among the competition. 2. Are the employees satisfied? One of the best techniques to judge a company is by having conversation with employees. Many companies put on a good cover-up, but underneath the decorative Marketing is plenty of dissatisfaction. However, if employees of the company like it, especially if they like it enough to buy stock in it, that is undoubtedly a positive sign. 3. How well recognized are they? You may find a great start-up firm with all the symbols of success, but discover that it is lesser known. Many small or regional firms are popular in their own back yards, but the rest of the world may not yet know about them. Buying such unknowns can be a great way to invest in the next hot stock. If the fundamentals look good, sometimes being lesser known is a good thing for investors getting in on the ground floor. 4. If they went out of business, where would you go for similar products or services? If you can’t think of a suitable substitute, the company is probably in a niche market that enjoys customer loyalty and repeat business. Shop from place to place, and observe what you understand and how each business makes you feel. Then trust your insight. Make a list of firms that get your attention, and then call their shareholder relations division and ask for more details. By starting your list with companies you already have a first- hand experience, you increase the odds significantly that you will make shrewd selections.